If you’re particularly trigger-happy with your camera, chances are sooner or later, you’d want to know how many shots you’ve fired with your Nikon DSLR camera. You might also want to know how many shutter operations a Nikon Digital SLR has gone through, for example when considering a purchase of a used unit. Well, head over to Dr Chung’s site where you’ll find a piece of software called ‘Preview Extractor‘. 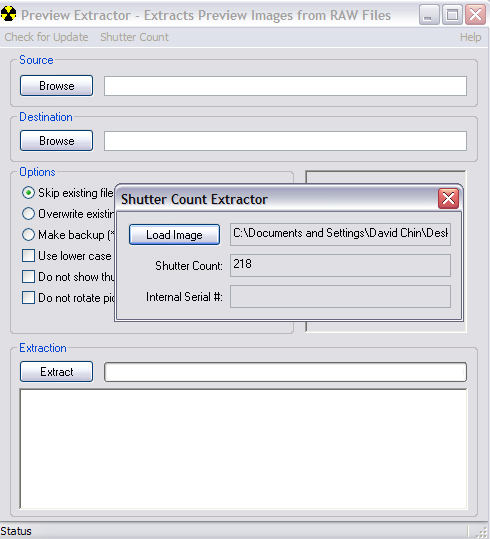 The code’s primary purpose is to extract JPG images from NEF files, but also doubles up as an ‘odometer reader’ for your Nikon (the site also has some other useful software that you might want to check out), extracting the shutter count value that’s found embedded within each Nikon digital SLR image. This is the only known way of obtaining the number of times the shutter has been tripped without having to send the camera in to a service center. Alternatively, you can try out other EXIF readers such as Opanda.